It was in late August—make that mid-September—make that early October—that just about everywhere I visited I spotted this cheery, perfectly charming plant. 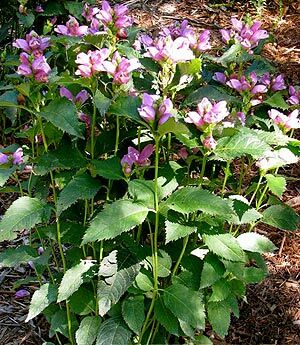 So to the list of underused, extremely worthy perennials, let’s add Chelone, an exceedingly easy-to-grow North American native. Chelone’s primary assets are its glossy, dark green foliage, lovely clusters of softly colored, rounded flowers and the fact that flowering begins in August and can extend through September to early October, that vast period of time when fresh bloom is most needed. The common name of this plant is derived from the fact that the flowers resemble turtle’s heads with their mouths open. Turtlehead grows best in full sun to partial shade. If you can give it at least four hours of sun, you should be fine. If plants in partial shade get a little leggy or flop, this is a great perennial to pinch down in spring, resulting in stockier plants and better bloom. Plants prefer humus rich, moist soils, and do a fair job of tolerating clay. They make wonderful bog plants, and their cultural requirements and appearance lend them to poolside placement in water gardens. Plants grow from 24” to 36” tall depending on soil and sunlight, and form a dense mound of attractive, dark green foliage. 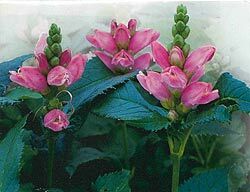 C. obliqua (Rose Turtlehead) grows much the same but bears rosy pink to purple flowers.